THE DAY DAWNED bright and sunny, which made life much easier for the volunteers who dashed around making last minute preparations. Roger Packham and Derek Neal were out with the bunting, decorating Caterham Station, East Surrey Museum and the Soper Hall. Paul Sandford and Roger Hammond manhandled boards into the Soper Hall and set up the displays. I prepared glasses, sherry, juices and nibbles in East Surrey Museum. June and Neville Hurrion, Ian Scales and Robert Warner were everywhere giving a valuable helping hand. Other willing helpers made the tasks so much easier and were much appreciated. The plan for the day involved a reception at the Museum, the unveiling of a plaque at the station, lunch for invited guests at the Pasta House and displays all day at the Soper Hall. The arrangements all went smoothly. Mid-morning guests began arriving at the museum. About 100 were invited to share in the celebration of Caterham Railway’s 150th anniversary and the Bourne Society’s golden jubilee. Displays had been mounted in the Museum. A brief break in the hubbub gave Roger Packham an opportunity to introduce Steve Altria, vice-chairman of Tandridge District Council, who presented a short speech welcoming guests to the occasion. Norman Skinner read a poem he had written. On such a beautiful day, it was even possible to have seats outside on the lawn. A jolly trio of musicians, the Alabami Bounders, played music to accompany the event. ‘Thank you all for supporting the celebrations and I would like also thank the Bourne Society Sub-committee for organising the day’s events (Gwyneth Fookes, Paul Sandford, Roger Hammond, Irene Keefe, and Nigel and Kath Harris). Thanks are also due to the East Surrey Museum and Friends of the Museum, Steven Altria, vice-chairman of Tandridge District, Norman Skinner, Deborah Todd (Station Manager, Southern Railway) and staff and Colin Miller for organising the band. After expressing her pleasure that the Society was celebrating the 150th anniversary of the railway and congratulating it on its Golden Jubilee, Mrs Todd pulled the cord that unveiled the plaque. Press photographers were present and the cameras were busy. Some members of the Society and invited guests then enjoyed a traditional English dinner at the Pasta House in Caterham. I reminded those present that the occasion was reminiscent of the celebrations following the cutting of the first sod when the railway was built in 1856. On that occasion two sumptuous feasts were held. The local press at the time reported that ‘there followed two ‘sumptuous feasts’, one (third-class) for the poor, the old and the young, who were regaled with roast beef and plum pudding at the Half Moon Inn, the other (first-class) for the directors and their friends at Manor Cottage (Manor Park).’ I suspect that the press were invited to the ‘third-class’ event, and, consequently, they did not report on the menu at the first-class feast! I don’t think that, nowadays, we would dare repeat the event held on 4th August 1856. There was a ‘cold collation’ for directors and their friends at the new Railway Hotel in Caterham and then, so one press report described, the company was conducted round the country on a fine, hot day, diversifying the enjoyment by occasional sojourns at improvised halting-places where, by a careful forethought, ice champagne and other agreeables had been provided. The proceedings were later followed by a déjeuner in a marquee on Mr Fuller’s lawn. 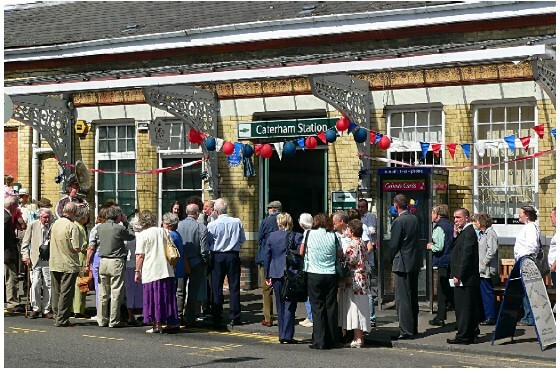 The centenary of the railway in 1956 was a grand affair – a dedicated steam train puffed its way from Purley to Caterham, with crowds welcoming it as it passed through every station. At Caterham a military band was playing. A dinner was held at the Soper Hall and an exhibition was arranged in St John’s Hall in Stafford Road (now Caterham Cars opposite the East Surrey Museum). In typical modern style TV cameras were there. 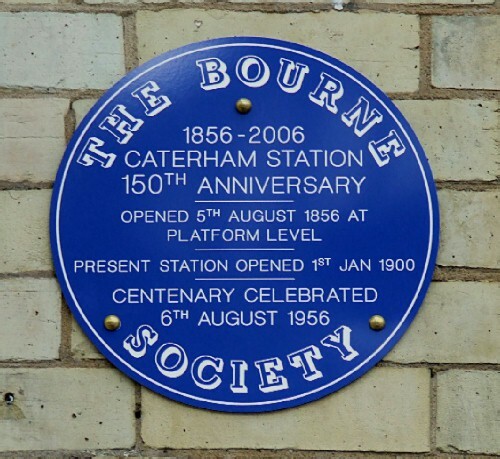 The Caterham Railway is a valuable asset to life in the Bourne valley and, I hope you agree, so is the Bourne Society in its role of making sure that ‘the good old days’ are not forgotten. Will you be here in 2056 to help organise and enjoy the bicentenary? During the afternoon of our celebrations in 2006 the displays at the Soper Hall and the East Surrey Museum remained open and both were busy. By 5 pm, the events were over and all was packed away at the end of a very successful day.